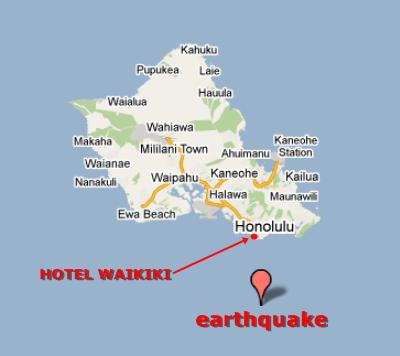 the 10 o'clock local news said that today's earthquake happened 15-miles offshore from Waikiki. That's getting too close for comfort. I'm only guessing, but probably the majority of Honolulu buildings aren't built earthquake proof. What I'm not guessing is that our minds aren't earthquake proof. okay, it seemed to have fixed itself. why are all the words on my site in bold now? It might go away by itself because I have no idea whatsoever of how to unbold it. Yahoo attempting to take over Blogger? Rowena- I seen the same thing happen to other people's blogs, too, and the reaction is why would they bold their words, as if so self-important. That's mainly why I posted a public notice that it wasn't my idea. David and I did not feel the earthquake at 3:29 pm on Sunday. The house did not shake and neither did our sofa! What gives? gigi- it only lasted for a second, but there's nothing in the area of the epicenter, fault line, or any volcano activity, that would make sense of it. Guess I'm a little late to see this story. Glad to hear you're ok man. There have been quite a few earthquakes lately. Seems like I'm hearing about them more now than before. We've been having some wicked storms here on the East Coast. This morning, the tree across the street from our house was struck by lightning. It was the loudest crack I've ever heard and it set off our house alarm. (It also simultaneously disabled the keypad so I had to take the damn thing apart to make the deafening siren stop.) So. You had an earthquake. I saw a bolt of lightning. What the hell is next, brother? Brad- the earthquake wasn't even a full shake, but unusual. The lava flow on the Big Island (island of Hawaii) is threatening some houses. Ann- I bet the lighting bolt was loud .... right across the street. What happened to the quiet neighborhood? The buildings of Oahu do have a code to follow concern earthquakes but not as high as that of the Big Island.